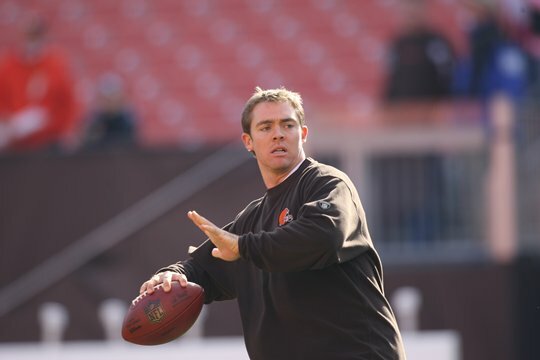 Cleveland Browns coach Pat Shurmur addressed the topic on everyone’s mind in the wake of the team’s 6-3 win over Seattle on Sunday: just what do the Browns have in quarterback Colt McCoy? Shurmur’s comments are spot on and show that the Browns are handling the McCoy situation exactly the way they should – by letting him play. The only way we’re going to know if McCoy has what it takes to lead the Browns into the playoffs on a regular basis is to let him play this season. Too often in this town we’ve seen coaches mishandle the quarterback position, not being able to settle on one player, benching quarterbacks after two games only to make them starters again later in the same season. And it has to end for the team to have any hope. This isn’t an endorsement of McCoy as the long-term answer. The stats through six games are certainly not pretty – 27th in completion percentage, 33rd in yards per attempt, 32nd in passes of more than 20 yards, 28th in quarterback rating. This being Cleveland, half the fans always want the back-up quarterback to play. Of the other half, the majority just want someone else. But that doesn’t work and it’s not how you run a team. The Browns need to stay the course with McCoy. They need to be certain whether or not he’s their quarterback. And the only way that is going to happen is by letting him play. There is probably nothing more important this year than for the front office and coaching staff to be able to make a definitive decision on the quarterback position for the future. If McCoy can stay healthy through 16 games – and that’s no certainty with the play of the guards and the right tackle – there is no doubt that we will all know the answer the morning after the Jan. 1 game against Pittsburgh. You can’t really ask for anything more than that. One hundred and forty-six total yards of offense. No first downs until the 5:26 mark in the third quarter. Sixteen total yards of offense in the first half. One passing yard in the first half. The Browns’ box score from Sunday’s game against Seattle? Think again. Those are the offensive numbers the Baltimore Ravens put up Monday night against Jacksonville. You know, the first-place Ravens, allegedly Super Bowl contenders? That’s all they could do against a 1-5 Jaguar team that is playing for a lame duck coach before an apathetic fan base. But to hear the anti-Holmgren crowd tell it, the Browns are the worst team in the history of forever after their win against the Seahawks. Think Ravens’ fans would have been crying this morning if Baltimore would have figured out a way to win while only scoring six points? We could have sworn it was guard Jason Pinkston who got blown up on Sunday by Red Bryant on Bryant’s two blocked field goals. But the Beacon Journal‘s Nate Ulrich wrote that: In the second quarter, Oniel Cousins lined up at left guard and fell on one knee while trying to get out of his stance, allowing Bryant to break through the line and earn his first block. In the fourth quarter, Alex Mack played left guard and kept his head down as Bryant maneuvered past him for another block. Alex Mack, huh? Guess the Browns should have drafted Mark Sanchez after all.